The 2018 Grand Chess Tour is a series of five chess tournaments held throughout the year and across the globe. 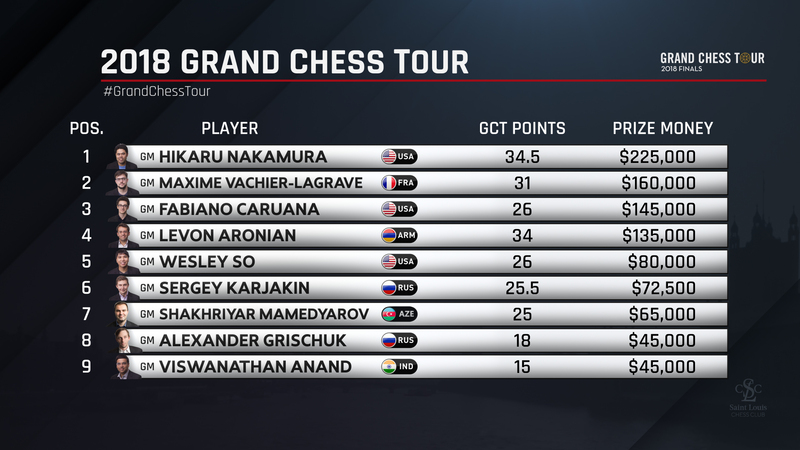 A total of ten players were selected as full 2018 Grand Chess Tour participants. Selection methodology for the 2018 participants is listed in the table below. 2018 Tour Points will be awarded based on the final rank of each player in the events as set out below. Tour Point allocations for the 2018 Sinquefield Cup have been increased this year to ensure that a suitable balance is maintained between classical chess and rapid and blitz chess. Another important change is that GCT Tour Points in 2018 shall be shared equally between tied players in all individual events. Tie-breaks will still be played to determine the overall winner of events but will not impact the allocation of GCT Tour Points in 2018. * For full schedule details, please visit the respective tournament pages.